Porto Cervo becomes centre of the sailing universe this week for the Maxi Yacht Rolex Cup, run by the Yacht Club Costa Smeralda. This year 37 yachts are competing from Swan 60s and Wally 60s up to new 48m long angular Arzani Navi-built Nativa. The Maxi fleet is divided into the Supermaxis (above 100ft), the Maxis (72-100ft), the Wallys and Js. Four Js are competing - Rainbow, Ranger, Shamrock and Velsheda, plus the more modern but equally pointy ended 'F-Class', Firefly. 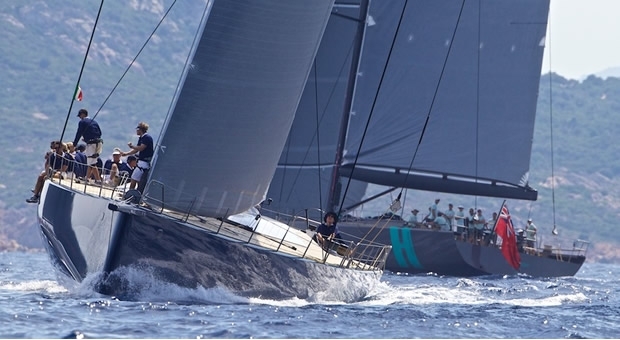 Among the Wallys, the Maxi Yacht Rolex Cup will be the first line up of the two WallyCentos - Sir Charles Dunstone's Hamilton and Sir Lindsay Owen-Jones's Magic Carpet 3. However the biggest class is the 60-72ft Mini Maxis. Six of these are competing in the Racing sub-division of the Mini Maxi class, competing for their World Championship. This includes the Judel Vrolijks - Niklas Zennstrom's Rán 2 and last years launches - American Hap Fauth's Bella Mente and Italian Alessandro Rombelli's Stig. Rán 2 the 2010-11 World Champion narrowly lost the title to Bella Mente last year, but this year all three boats will face stiff competition from the newest Mini Maxi, Andres Soriano's new Mills 72, Alegre. other strong contenders are the old Mills 68 Alegre, now called Caol Ila R and American George Sakellaris' Shockwave. "The (Mini Maxi) boats are amazingly fun to sail," says Niklas Zennström. "They are powerful and for monohull sailing boats as good as it gets today. The fleet is getting closer which means there are more boat on boat situations at [mark] roundings, and close crossings, which sharpen your skill as a helmsman. Racing starts today and goes on until Saturday with a layday on Thursday.